﻿OH MY ELLE WOODS! Imagine a scratch-and-sniff sticker had a baby with our favorite french cookie, the macaroon, and ta-da! 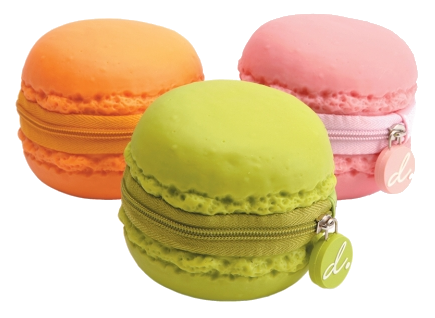 Meet the Scented Macaroon Coin Purse. I'm absolutely no Elle Woods nor Marie Antoinette but I don't mind getting my hands on these eye candies. They are just too cute and it almost looks like the real thing! I don't know if this is spacious enough to hold that much coins though. And I think I'd pass on the "scented" part -- the smell of metal and the macaron coin purse's sweetness, I'm sure, is not a great match. You may order these online (it comes in 6 colors) through FredFlare.com. 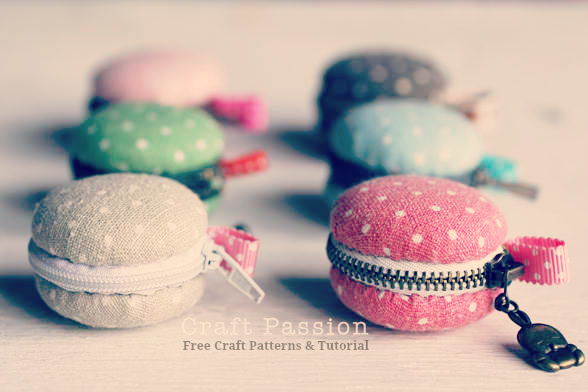 But if you're a crafty soul that would rather make a customized piece for herself, I found an tutorial on how you can make your own macaron coin purses! Craft Passion offers a wide variety of topics and tutorials, from crafts of every kind to recipes! Every tutorial is detailed and every step is photographed so that you can easily follow the instructions. This is certainly a wonderful website that is of great help for all your crafting needs! 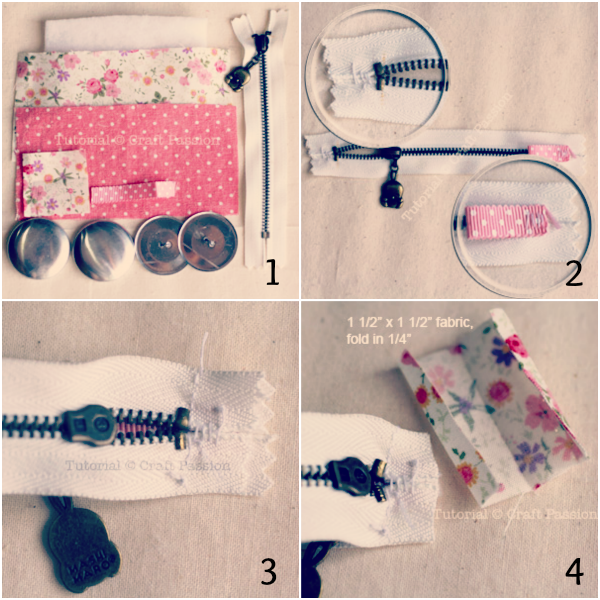 ﻿Get ready all the materials and tools needed to sew a macaron coin purse. Sew to join the zipper tape together above the top stops. Fold the ribbon into half and sew it on the bottom stop with ends facing zipper end. 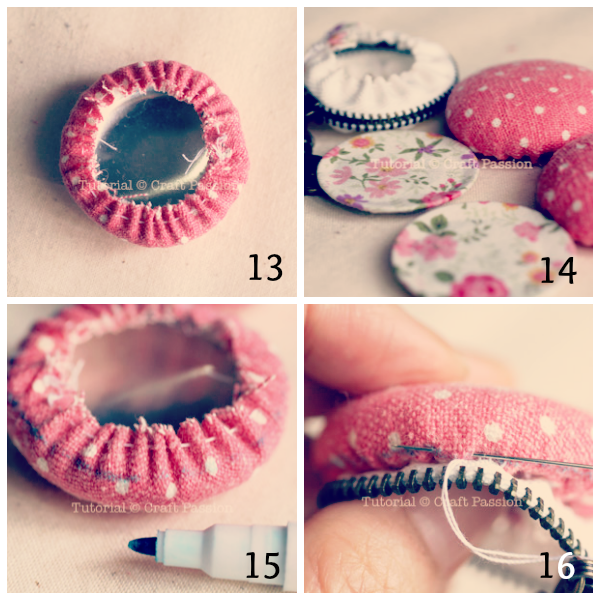 Fold the zipper right side together and sew to join it into a ring. Trim the zipper ends to 1/2″ seam allowance from the stops. Fold the 1 1/2″ square fabric into half then fold a seam allowance of 1/4″. Encase the seam allowance and bind it by sewing the fabric onto it. Bend the binder to the bottom stop side and sew it on the zipper. Turn to the right side and this is how your zipper is going to look like. Make small running stitches along the edges of the zipper. Pull to gather. Repeat on the other side. Set aside. ﻿Cut away the button studs from the back plates. Be careful and point the stud away from you and /or anyone while cutting it. This little tiny metal can really shoot far. Set aside. Trace circles to the fabrics with pencil or fabric marker. 2 3/4″ circle on main polka-dot fabric and lining fabric, cut 2 from each fabric. 2″ circle on batting, cut 2. Apply a thin layer of glue on the cover and attach it to the batting. Make 2. Let dry or until safe to work on it. Pull the thread and gather the fabric onto the cover snugly. Knot the thread. Repeat the same to another cover and 2 back plates. Use an erasable fabric marker to plot a circle along the back of the cover. The line should be on top of the metal edge of the cover. Slip stitch the cover to the zipper, about 3/8″ from the center line of the zipper. The further you sew from the zipper, the bigger the coin purse space is. ﻿Completed 1 cover, repeat the same to the other side. Turn to the inside, place the back plate on and slip stitch it to the zipper. Repeat the same on the other plate. 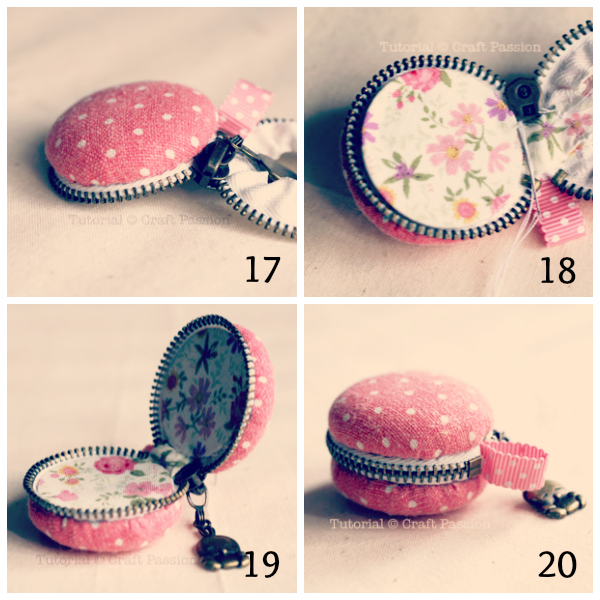 A completed macaron coin purse. The storage space is quite small, good for keeping ring, and bracelet. Or, merely use it as a key chain or hanging ornament. 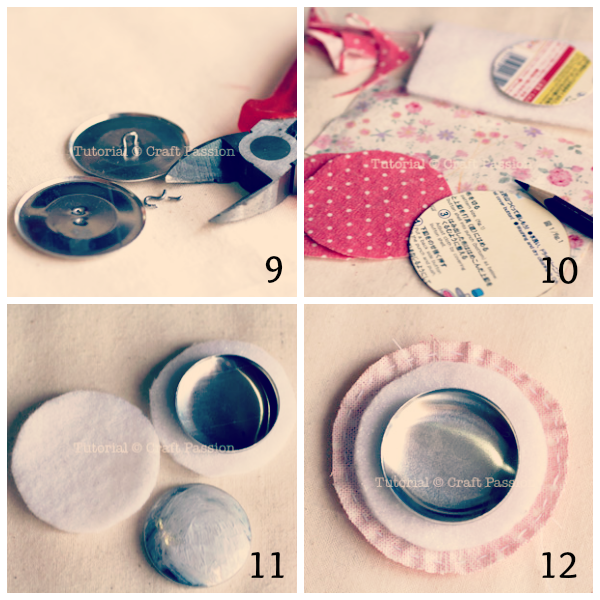 If you can find a small circle mirror of about 1″ to 1 1/4″, glue it on the back plate and turn this macaron coin purse into a small cosmetic mirror. View from the bottom stop of the macaron coin purse. That's it! I'm excited to make my one of these! 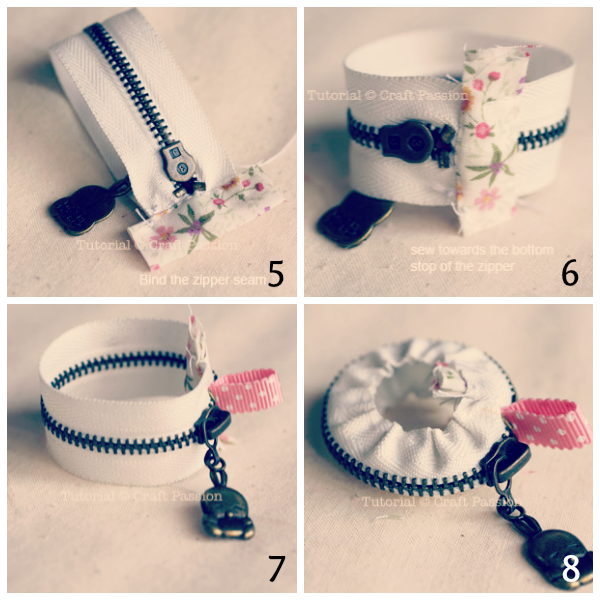 Hope you enjoyed this tutorial by Craft Passion. If you're interested in making more crafts, please do visit Craft Passion's website by clicking here. You'll never run out of DIY ideas. Happy crafting!